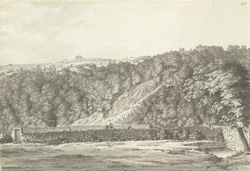 A view in ink of the woody bank opposite the Hotwells taken from the dining room window at Mrs Rossignol's house at Syon Row, drawn in the autumn of 1789. It is unsure who Mrs Rossignol is. She may have been connected with Grimm's patron, the Rev. Bart.